So I drove past a billboard I designed here in the Boston area, and in my 7 or 8 years of designing, it's my first billboard! Well, there's actually 30 of them around Boston with 4 different variations. Obviously not a mind blowing concept or design, and I would've been happy with the copy being short enough to read in 3 seconds, but hey, it is what it is and I'm proud of it. These are the smaller "eco posters", short for economical (not ecological). I did one of the larger ones you'd see on the highway, it's up somewhere, and the software box breaks the top boundary of the billboard, no big deal. 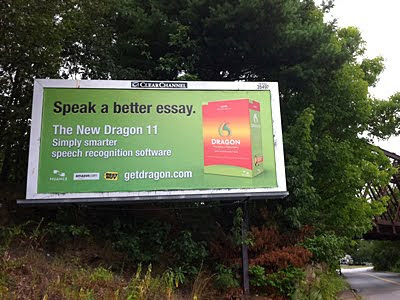 Just one more billboard and I'll achieve total design consciousness.